Puma H-Street Wear & Longevity: How Long Do They Last? 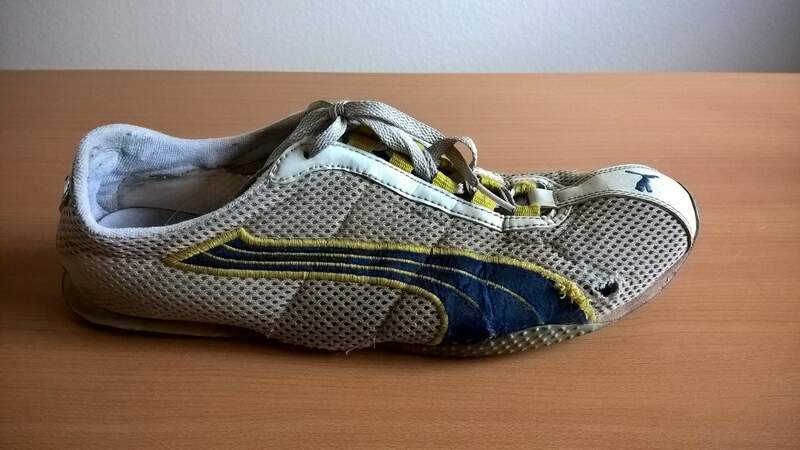 “I can’t believe you’re still using those shoes,” a couple Fort Collins runners told me as I did a warm-up run at the track in some rather well-worn white and blue Puma H-Streets—a shoe model that was a favorite of POSE runners in the 2000s and still is my favorite. But gauging by how the colored sole had worn through to the minimal padding under the heel of both shoes, my friends’ comments were probably warranted. Also, these were 2008 models that I had been using since June 16, 2009. Six years! How in the world did these shoes last so long? 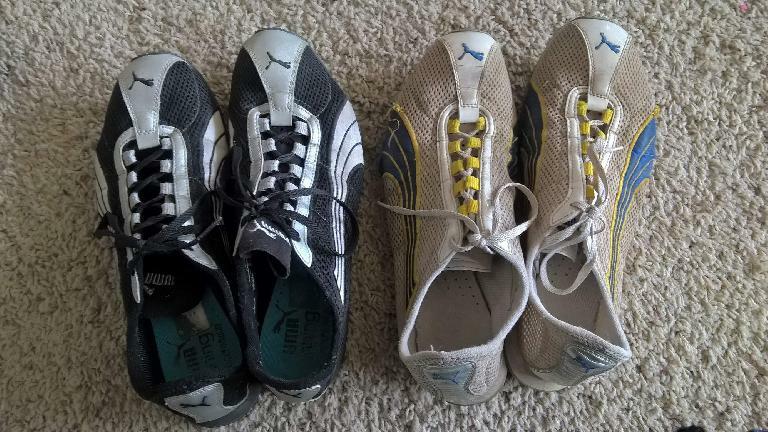 One reason is I was only using them for races and track workouts until early 2014, when I retired a pair of similar, but slightly heavier and less durable, Puma Salohs. After that, the H-Streets became both my training and racing shoes. A second reason is the Puma H-Streets are simply very durable. 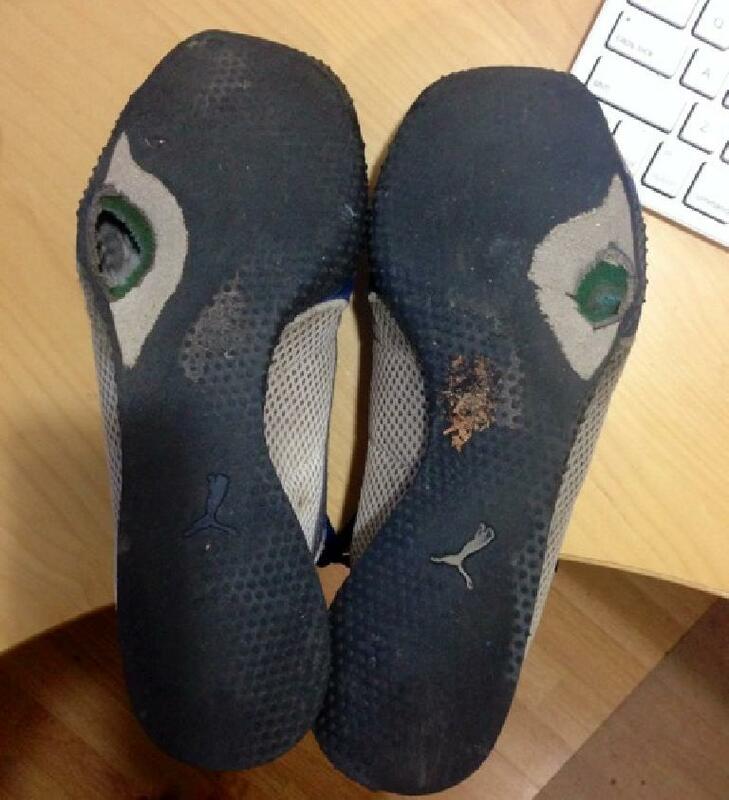 I got 1114 miles out of the very first pair, and these went 1174 miles and 220 hours of running. The fabric was starting to tear where it met the sole, but nothing too alarming. 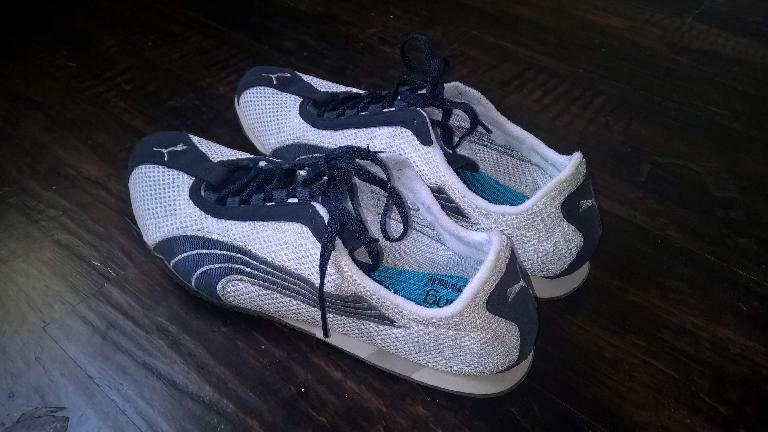 I might have continued to run with them even longer had I not have two additional boxes of 2012 Puma H-Street+’s and I was not getting all those comments. On the other hand, it appears that how quickly the Puma H-Streets wear is largely dependent on an individual’s running style. 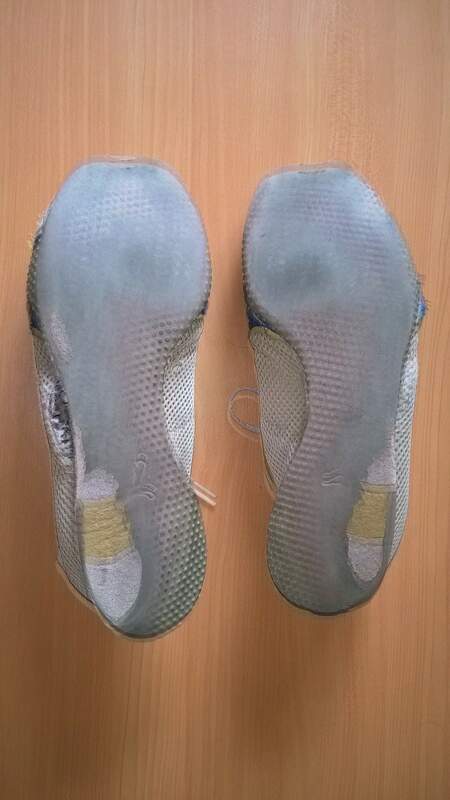 My friend Adam, however, has worn some pretty significant holes in the soles a couple centimeters outward of where the ball of his feet would be. 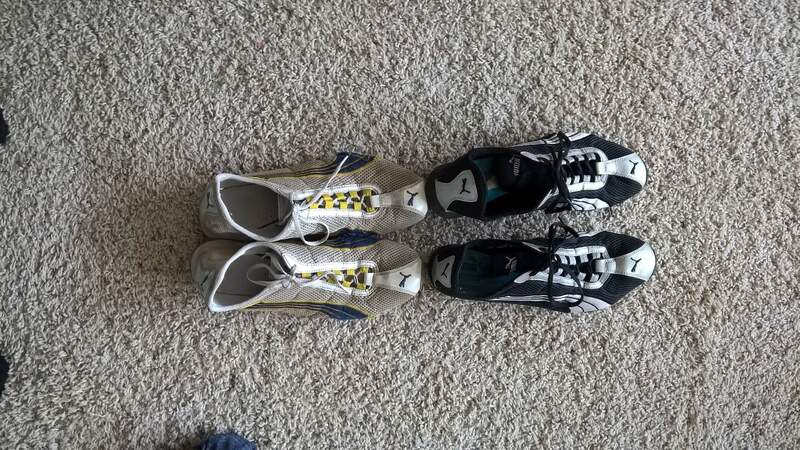 In fact, one of the photos below are of his and my shoes. His are the ones in the Oakland Raiders colors. Never mind that he is a San Diego Chargers fan. I think it is so cool that we run in the same shoes! They are really lightweight: only 5.8 ounces each. They are inexpensive: usually about $40-65. They are long lasting, as discussed above. I have successfully used them for over 100 races between 1-100 miles, including off-road ones. I like their style. They also often come in different colors. It seems like Puma has been making the H-Streets for decades but frequently stops making them for a couple years before bringing them back. When they have brought them back (e.g., 2008 and 2012), I have stocked up on some boxes. Fortunately, there are other channels you can usually find them from. 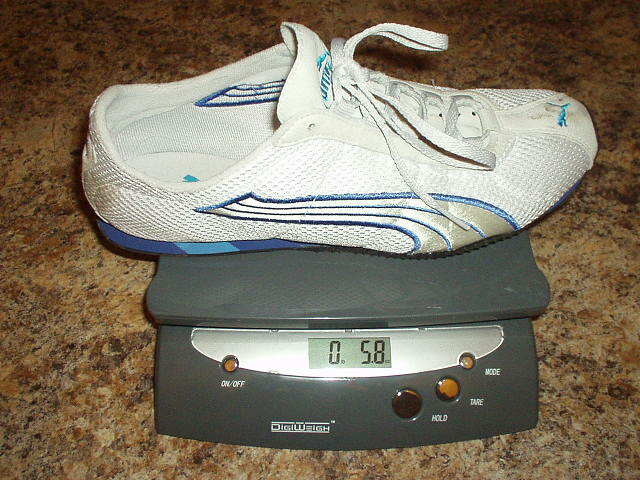 For example, eBay has many listings of Puma H-Streets, albeit not in every size. I’m at 318.0 miles with my “Oakland Raiders” Puma H Streets, and the first hole has popped through the sole of the left shoe. I don’t know how you kept your soles hole-free for 1000+ miles! I’ve been scouring the web for H Streets in my size, but have left empty-handed in my searches. If and when Puma creates a new lot, I’m going to be buying half a dozen of them to use. Thanks for the update, Adam! I would suspect that based on the premature wear of your shoes (and also blisters you showed me) you are striking the ground too hard, but considering how fast you have gotten while not getting any injuries, maybe your running form is fine. Also, when I ran with you in Colorado, it did not sound like you were striking the ground hard (but then, we were not running fast). In contrast, I was once told by someone that it sounded like I was “slapping” the ground. So I do not consider myself the quietest runner. Yet I am consistently getting high longevity with the Pumas even though most of the miles I had on this last pair were “racing” miles. I’ve had 2006, 2008 and 2012 Puma H-Street models; I wonder if that means Puma will be bringing them back in 2016? What if several of us emailed Puma often enough asking for perhaps a limited edition version to be released? The Puma H-Street is by far the best running shoe I’ve ever owned.